Last night our temps dipped into the high thirties!! We turned on the heat. But the cool snap is over with temps rebounding back into the fifties overnight and seventies during the day. Of course, the sun is much lower in the sky making the autumnal warmth harder to catch. See the pumpkins near the doorstep? trade you some coolness for some heat. gonna hit 95 here tomorrow. It seems too early to have these cold temps.. I love your cute Autumn decorations.. Have a happy week! I am crazy over your Fall things! Especially the squirrel and the wooden pumpkin! I would love to get a closer look at the turkey on your table, is it wood? I am a big fall decorator, too. The weather has been the same here, too. 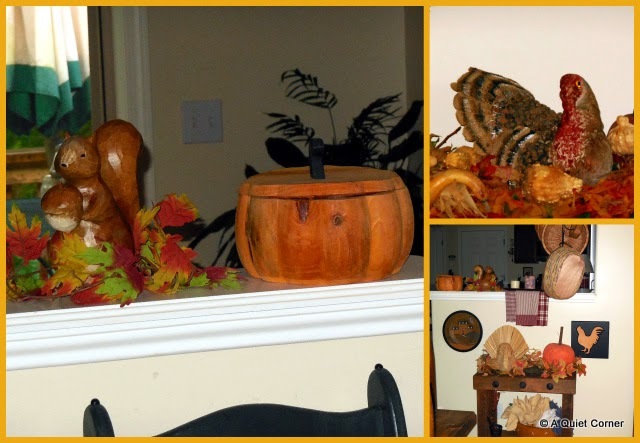 Some sweet autumn decorations, including the wooden pumpkins by the door. I also like the basket with the sunflowers. Thank you for linking to Mosaic Monday JP. Nice splashes of autumn colour. We are having spring warmth in Perth right now and heading up to 32C on Monday (89.6F). Another taste of summer to come and we're only half way through spring. I fear it is going to be a very hot summer this year and here I am a winter lover. What lovely decorations! You fooled me at first with your mention of temperatures in the thirties. Then I realised you still use Fahrenheit over there. In Centigrade the mid thirties would be positively warm! we've got that same kind of weather although I don't think it hit 70 yesterday. 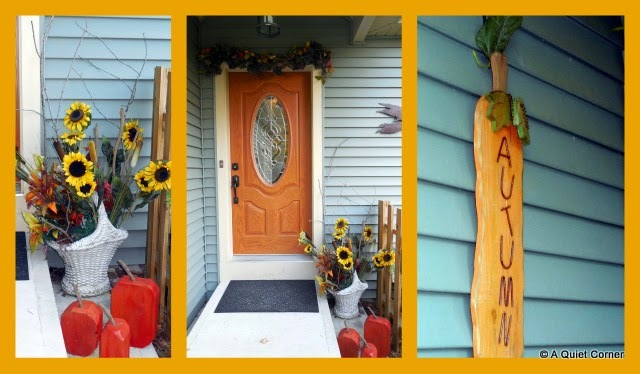 Your fall decor is really pretty and I like the 3 carved wood pumpkins on the front step. It's cooler here too and very foggy this morning.